The Newest Rant: Television Tuesday: People Really Ought to Watch, "American Housewife." Television Tuesday: People Really Ought to Watch, "American Housewife." There is a show on television that is absolutely hilarious. Called, "American Housewife," it follows a middle-class family in a more upscale neighborhood as they have various hilarious events unfold that assist them in both growing as people and giving us laughter. It has a delightful mixture of quirky-and-dark that reminds me of shows such as, "Bob's Burgers," and, "Everybody Loves Raymond." The characters are among some of the most easy-to-relate-to on television and I can't believe more people don't talk about Katie and Greg Otto (and their three kids Taylor, Oliver, and Anna-Kat). In the midst of its second season, my wife and I discovered the show when it came on right after another program we watch, "Modern Family." While, "Modern Family," has been on for years and sometimes struggles to be as funny as it once was, "American Housewife," fires on all cylinders almost constantly. A third season has not yet been announced but Samii and I really hope it will be. 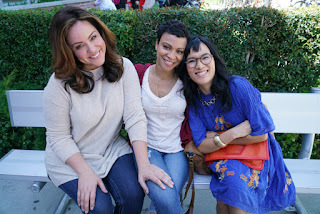 The fantastic acting of Katy Mixon as the the mother is wonderful, with her observations about wealth inequality, fat-shaming (she is a bigger woman), and anything else always hitting the mark. 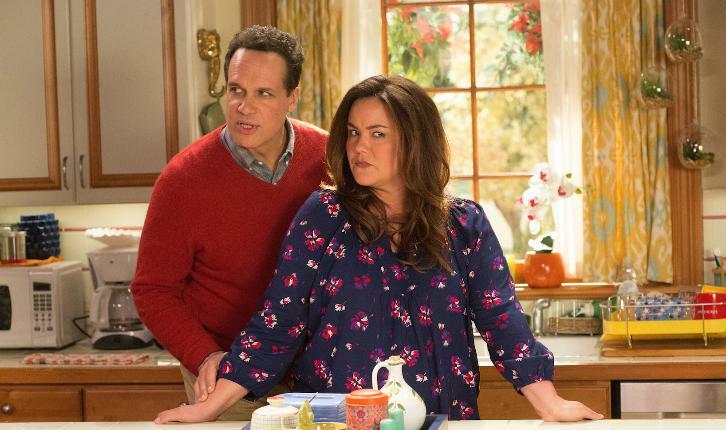 Diedrich Bader is great as Greg as well, bringing just the right mixture of neurotic-and-fun. 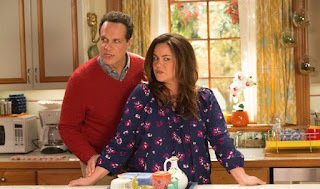 Diedrich Bader and Katy Mixon as Greg and Katie. Many of the plots on the show involve the family's children, with the eldest, Taylor, played by Meg Donnelly, as a testy high-schooler who loves her parents, but also finds them to be incredibly annoying in how they won't let her do whatever she wants. Middle-child Oliver (portrayed by Daniel DiMaggio) is often annoying--but intentionally so--as a status-obsessed young man who wants to grow up to be one of the rich people they always see in their town of Westport. Lastly is the youngest, Anna-Kat, played by Julia Butters, who is a bit of a wildcard in her mixture of sweetness yet also being obsessed with gory aspects of history and exotic pets (for a while the family had a pet pig named Hans Gruber). Anna-Kat seems like the kind of kid who will either grow up to be an interesting and nice adult, or a total sociopath--wondering which is part of the fun. A great deal of humor in the show comes from normal everyday challenges and events that are made laugh-inducing thanks to the stellar core family cast as well as an assortment of strong supporting characters played by such great actors as Ali Wong and Carly Hughes(who portray friends of Katie) or George Hamilton as the family's rich-yet-also-in-deep-legal-trouble neighbor Spencer. Basically all the casting on the show is pitch-perfect and a major reason this program is so good. Katy Mixon, Carly Hughes, and Ali Wong. As I said earlier, "American Housewife," has not yet been renewed for a third season, but I really hope it will be, as Samii and I love watching it! As long as it can continue to be as hilarious as it is, "American Housewife," is a show you really ought to check out. Give it a viewing and the odds are pretty good you'll be cracking-up!